The first year of any new business is always going to be a trying time for its owner. It’s a time characterized by endless hours, obsession and doubt. It’s also a time that, for many new business owners, is characterized by serious mistakes. And in the current economic climate, serious mistakes aren’t really something that you can afford to make. If you’ve recently opened a new business, or you are about to, it’s important to accept that you’re not going to get everything right. Even the most experienced entrepreneurs don’t manage to do so. It is however important to keep the number of things that you do wrong to a minimum. In particular, you should avoid making any of the following surprisingly common mistakes. They are mistakes that many entrepreneurs make during their first year running a new business. And they are mistakes that for some, end up costing them that business. All business owners want to keep costs as low as possible. But you cannot afford to make low costs your number one priority. Should you do so, you can easily end up making decisions that though cost friendly, are not profit friendly. A perfect example is how much you decide to pay in rent. There is no point in renting a cheap space if that location is going to make attracting customers virtually impossible. Low costs are important, but profits are more so. And any cost cutting technique that is going to lead to lower profits must be avoided. Ideally, you can afford to set up a new business without borrowing a penny from anyone. It’s certainly not fun having banks breathing down your neck when business is going poorly. But unfortunately, if your business requires X to succeed, and you don’t have X, a visit to the bank is a visit that you are going to have to make. If you try to change what your business needs to accommodate your own limited funds, you are setting yourself up for failure. It might be a more private failure with far less risk of bankruptcy but it is failure all the same. And you are aiming for success, right? Don’t hire friends or family members. When it comes to hiring decisions, you should be considering qualifications and experience, not family ties. There are many potential candidates out there. The odds of the best person for the job being related to you are pretty slim. It’s also worth noting that those who mix business with relationships, tend to lose at least one of them in the process. It might sound like fun, but are you really going to enjoy telling your friend what to do every they? And what if you have to let them go? It doesn’t matter how much you think you know about accounting, if you are not an accountant, you need to hire one. And if you haven’t been to law school, you are probably going to need to talk to a lawyer at some point too. Many entrepreneurs try to avoid paying these people. They attempt to do their own accounting. They attempt to act on their own legal advice. Doing so almost always ends in tears. There are many ways to cut costs without harming your business. But failing to pay for professional advice is certainly not one of them. One of the fastest ways to steal customers from the competition is always going to be to undercut them in price. There is nothing wrong with doing so. Unless of course, the prices that you are offering are unsustainable. This is an incredibly simple, but equally common, mistake for a new entrepreneur to make. 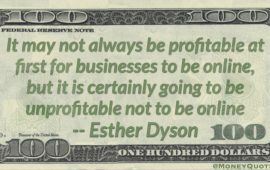 It doesn’t matter how much demand there is for your product or service if your profit margins are too small. And don’t forget to consider future profit margins. For example, if you are currently a one man show, a price margin of X might be sufficient. But will that profit margin still exist if you hire an employee? Just because you have been with a particular financial institution for quite some time, that does not mean that they are the right choice for your business. Though just about every bank will talk about their dedication towards small businesses, not every bank will stand by you should you be in need of a loan. Ask other small business owners or seek the advice of an experienced accountant. Choosing the wrong bank may not be a mistake that affects you immediately. But if you face financial problems a year or two from now, it could be the mistake that ends up costing you your business. Barney Mosbey has been writing about offshore jobs for some time now. He recommends offshoreformations247 for those who want to find out details about an offshore company.